Flowers as far as eyes can see, flowers as varied as it can be in size, colour and shape, gentle streams flowing down from mountains all around, most picturesque meadows, distant snow peaks contrasting the green mountains that look in front of us and an occasional mist that makes the whole landscape more beautiful – this Valley of Flowers (VoF) national park in Uttarakhand state is still one of the few pristine biospheres located in India. It could more likely be attributed to the fact that until recently, the only way to reach was to trek. Things have changed now and there are helicopter taxis transporting people to-and-fro. More on this in “How to Reach Valley of Flowers” section. The valley houses many endemic birds and plants and is a haven for trekking enthusiasts. VoF trek is considered an easy to moderate one and one can opt it to get a taste of what a high altitude Himalayan trek would be like. 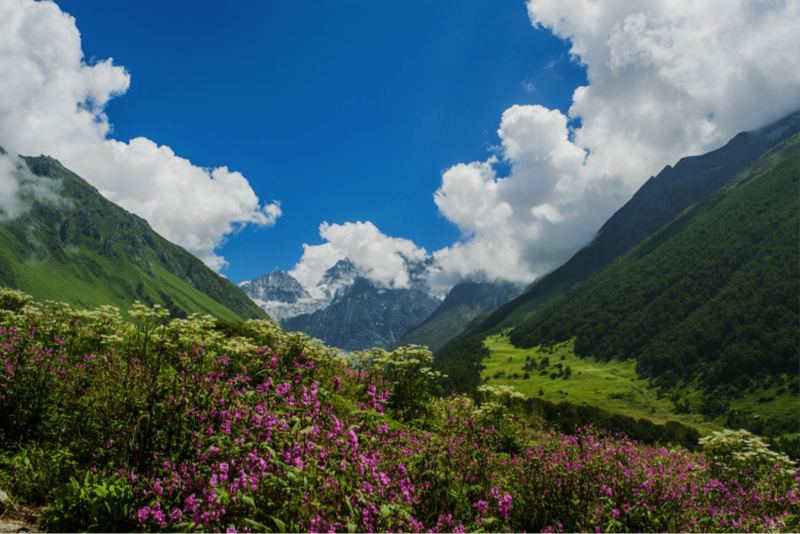 Valley of Flowers is nestled in snowy peaks such as Gauri Parvat (Tipra Glacier begins here), Rataban, Kunt Khal, Saptsring and Nilgiri Parvat. 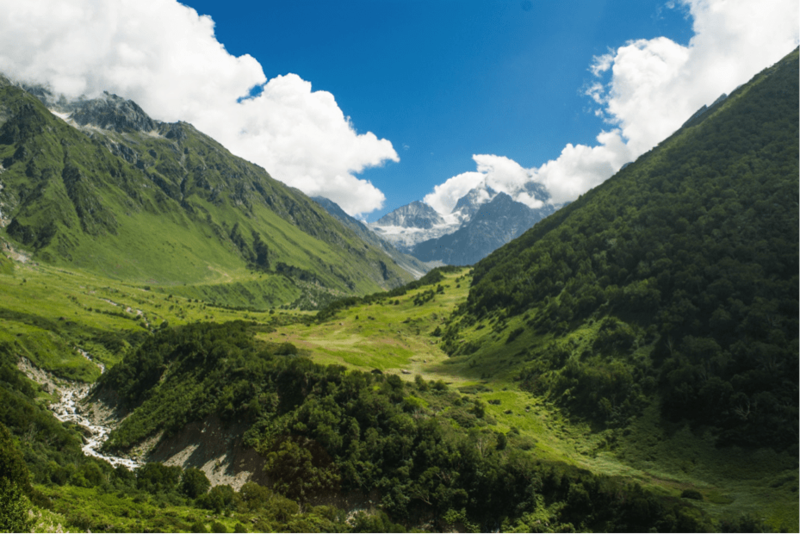 VoF is The park itself is part of the Nanda Devi Biosphere which is a UNESCO World Heritage Site. The streams that you see in the valley are actually rivulets that meet River Pushpavati which originates from Tipra Glacier of Bhyunder of Garhwal Himalayas and joins Lakshman Ganga at Ghangaria. From Ghangaria this river becomes Bhyunder, drains into Alaknanda at Govindghat around 12 km downstream. The valley runs along the banks of River Pushpavati. When a place is raw and natural, it generally is little difficult to reach. One has to take multiple journeys, although it is possible to drive directly to Govindghat from Delhi (approx. 500 km) avoiding few of the steps. 3. Trek start place (2195 m) to Ghangaria (2926 m) – is an easy to moderate trek. It is a gradual ascent and a well-laid path is available. Till half of this trail, River Lakshman Ganga is one side and after a river crossing (via bridge) we can no longer see the river. At certain places it is little steep, it is helpful if you carry a stick. This route has snacks shops (esp at river crossing) where you can have your lunch and proceed further. 4. Ghangaria (2926 m) to VoF (3505 m). We can further trek 2-3 km inside the valley to reach its further ends. Only 3 km of the valley is open to tourists and rest all is covered under Core Area of the park. 5. 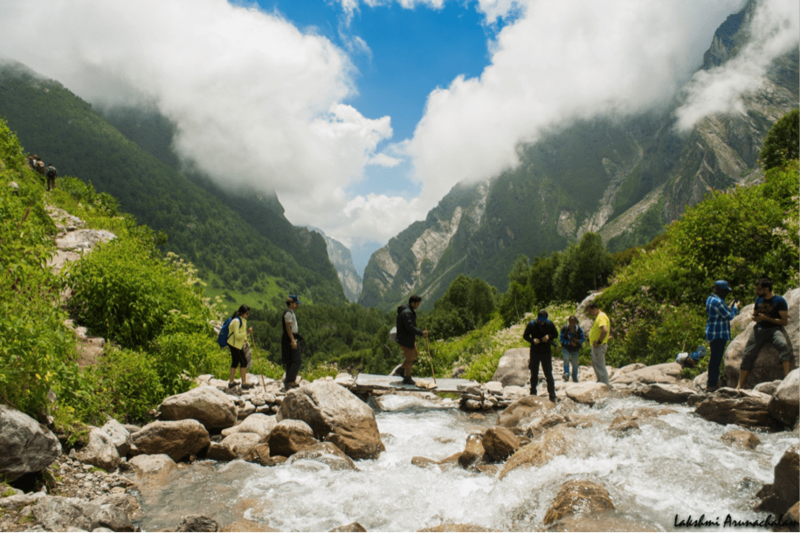 Ghangaria (2926 km) to Hemkund Sahib (4300 m) – Optionally one can also visit Hemkund Sahib (a Sikh pilgrimage site) which has a Gurudwara and a glacial lake behind it surrounded by misty mountains. It is a difficult trek of about 6 km but mules are available for hire in Ghangaria that can be used for Hemkund. We have to get a permit from the forest department to enter the VoF. There is a ticket counter (150 INR for Indians, 600 INR for other nationals) at the entry where you can purchase the ticket. The ticket is valid for 3 days. It is better to reach the counter early or get the tickets on the day you reach Gangharia. Overnight camping is not allowed inside the valley and all visitors need to exit by 5 pm. Every year a spectacular flowering bonanza begins in these high altitude alpine meadows. Though it is open around mid-June till Sep once the snow starts melting, the best time to visit to view the blooming flowers is July and Aug. The valley is not accessible beyond December until early May. Each month different flowers bloom carpeting in the valley in various shades of flowers. It might rain on a day or two, but the sight of the valley makes all the discomfort fly away. Day 1 – Reach Delhi. Overnight to Haridwar/Dehradun. Day 8 – Govindghat – Joshimath – Hardiwar/Dehradun. Overnight train/bus to Delhi. Govindghat – Badrinath is around 25 km and takes nearly an hour to reach. If weather permits, the majestic Neelkand peak can be seen from Badrinath temple. This temple is one of the abodes of Chardham yatra. Badrinath – Mana is 3 km which can be covered by taxi. The trek from mana village to Vasudhara falls is around 6 km which is one of the beautiful trails one can come across. If you plan for this trek make sure you start early in the morning. It is advisable to return by 1 pm or 2 pm to Mana village. There are no snacks, water available on this route, please carry sufficient supplies. It is a very scenic route and easy when compared to VoF or Hemkund Sahib. Panch Prayag – The five confluences of rivers in Garhwal region of Himalayas. Vishnuprayag, Nandaprayag, Karnaprayag, Rudraprayag, and Devprayag can be seen on the way from Joshimath to Haridwar. The color of water varies according to the season and is usually muddy/grey during Jul-Aug due to monsoon season. For the religiously oriented, a visit to Rishikesh and Ganga-Aarti at Haridwar in the evening can be added to the itinerary. Joshimath is the gateway to several Himalayan treks, pilgrim sites. Auli can also be visited from here. The route to Kedarnath also begins here. Mobile connection works (BSNL/Airtel) almost throughout except in Ghangaria/VoF and patches on the way from Haridwar to Govindghat. Mobile connectivity is not available in Mana/Vasudhara falls. Ghangaria – the entire village is full of hotels and guesthouses. The hotels are very basic sometimes without hot water in taps and it tends to get cold in the night. Haridwar – lots of options near the railway station, river. Unless it is a big group, I would suggest booking the room on-the-spot after checking it. Own Camping Gear – Of course, if you are one of those who loves camping then well, you can carry your own camps and stay up near by river or near by guest house. The nature is with you, just make sure to clean up the mess before you leave :). While trekking, it is better to carry first-aid (if weight permits) as there are no medical facilities available. Gangharia village has one medical shop for emergencies (but it is better to buy important tables/medicines upfront from Haridwar). Normal sports shoes are enough to do this trek but ankle high hiking shoes or trekking shoes with protection from water will always help in protecting your ankles from twists or injuries and keeping the feet dry. Please remember that many flowers/plants you see in VoF are endemic to that region. Keeping the place clean would ensure their sustainability. Do not litter inside the national park or en route. Be a responsible traveler. 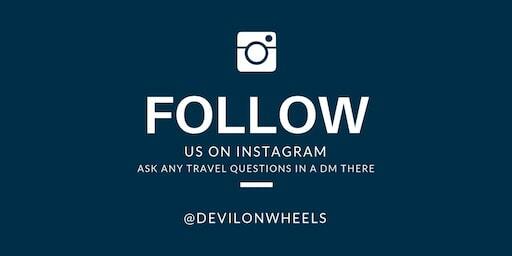 I hope you read the DoW tips on Responsible Travel in the Himalayas. Please carry water bottles from home and fill it up from pure water streams that flow everywhere. Let us not create more plastic waste in the already fragile environment! Please do not spray volini or drain out food waste anywhere that could affect the flora. 1. How difficult is the trek? Ans. It is easy to moderate (except Hemkund) and start practicing by brisk walking an hour daily 2-3 months before the trek. 2. What is the best time to visit the valley? 3. Do we need a trek guide? Ans. No. The trek path is well-laid and there are hundreds of people and mules going the same path. It is advisable to take a guide if you are traveling solo and need someone to help in case of emergency. 4. Do we need to book mule/porter in advance? Ans. No. They can be hired at the trek starting point. 5. Do we need to book helicopter ride in advance? Ans. Preferably Yes. You can contact Jaideep Bhai of Hotel Bhagat for booking. 6. Can senior citizens take this trek? Ans. Depends. We saw many seniors trekking even better than us. It does take a toll on the legs, so depending on fitness it can be taken. Otherwise, mules and porters are around to make the job easier. 7. Can children take this trek? Ans. It is better to use a porter to carry the children. If you like the article, please feel free to share it with any of your family or friends who are planning a trek to Valley of Flowers or VoF. 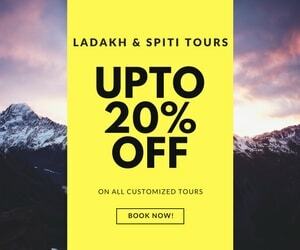 Now step out to experience the peacefulness and beauty of this amazing place in the Himalayas, and in the bargain, get fit too 😀 …. I am Lakshmi, a software professional living in Chennai, Tamil Nadu. I spend most of my holidays, long weekends on trips (Himalayan, wildlife safaris, birding, architecture etc.) and remaining of the days planning these trips! I am interested in photography (Landscapes, wildlife). I caught the Himalayan bug early on and fell in love with the mountains. The mountain keeps calling me every now and then; and we end up meeting as often as office leaves permit. On other days, I am either immersed in a book or would be watching movies. Now i want to ask that i want to go morrire via chushul .is the riad condition is good .is there any need of permits.but know this year i want to done this route definately.so plz tell me the full information . I am with u from 2010 .when we will done srinagar leh manali first time i get whole information from you and ur site . Thank you Sidhu bhai for following DoW since so long… It feel really good to see such attachment. I will suggest that you add one more day at Hanle between Pangong tso and Tso Moriri. Hanle is not a place to be missed. Your plan is good as you have experience. October now a day are good, not so desolated and snow does happen but mostly it is possible to do the trip as blocks are not prolonged. You need the special stamp permit for Chusul route from DC office in Leh. Mani, It is completely possible in your own car. Regarding Jaideep contact, let me get back to you if I can get it. You can check out their website hotelbhagat.com/bhagat/accommodation/index.html for details. Here is the contact number & email id. Hope you have a great trip to VoF!